I found these napkin rings on the net from Scissors and Spatulas and decided I had to try out my own. Instead of mini wreaths, I purchased some wood napkin rings and painted them. Here are the supplies I started with. 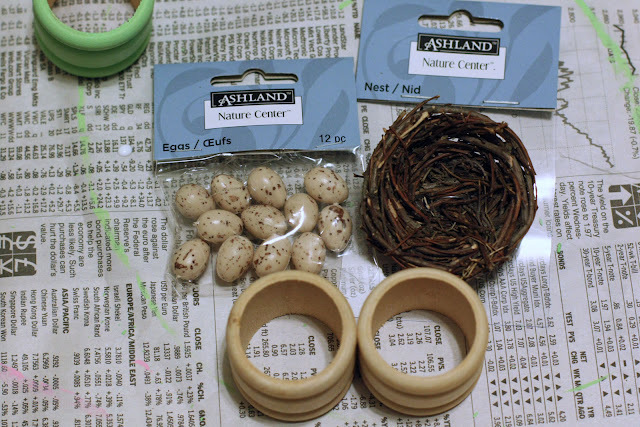 I just glued the eggs into the nests and then attached the nests to the painted rings. I discovered that the wire that was holding the nest to the package was perfect for wiring it to the ring, so I can remove them from the rings if I ever want to change them up. 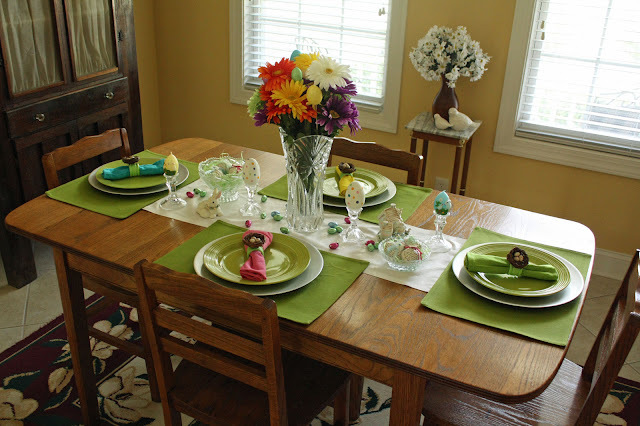 Once my napkin rings were done, I went about setting my Easter table. I went to the Dollar Tree for some plain white plates and they did not have four alike! I came home with these green ones instead, which I really like now that the whole tablescape is complete. 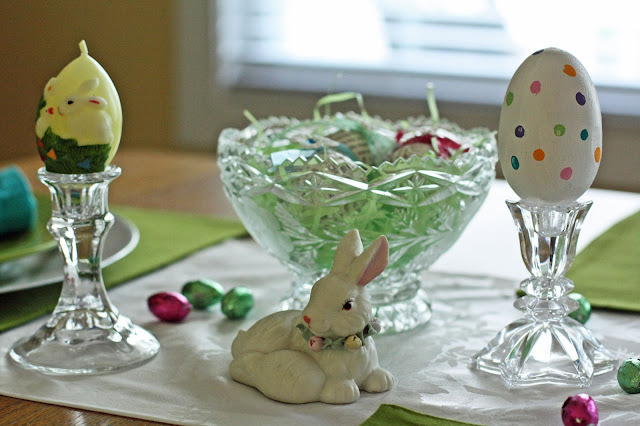 I wanted to do something similar to my gumdrop and candy tablescape from Christmas, so I placed some egg candles and painted wooden eggs on candlesticks the same way I used ornaments at Christmas. Yes, I painted the wooden eggs. My secret for the polka dots is to dip a pencil eraser into paint and make my dots. 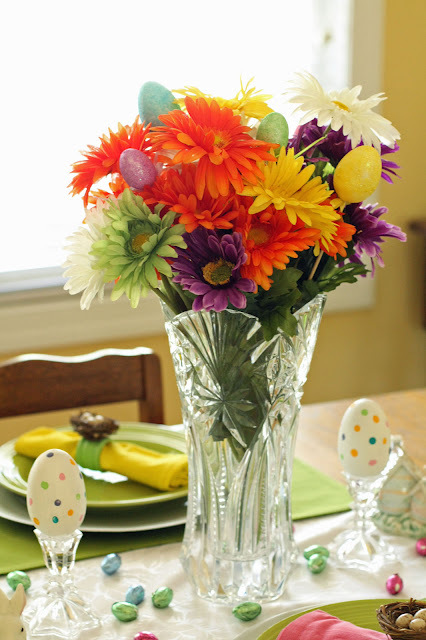 I wanted an egg tree for a centerpiece, but I don't have one and decided instead to use these colorful daisies I bought last year and hadn't used yet. I tucked some egg picks into the arrangement. 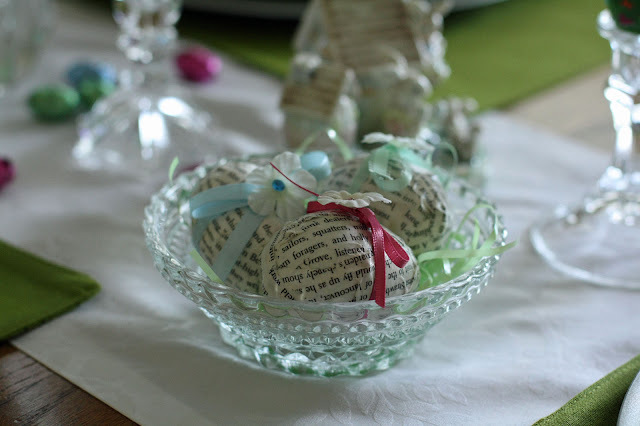 Lastly, I placed my book page eggs into a couple of bowls and placed one on each end. It's really nice! What a pretty table you have set up! Have a great holiday! Your table scape looks lovely! 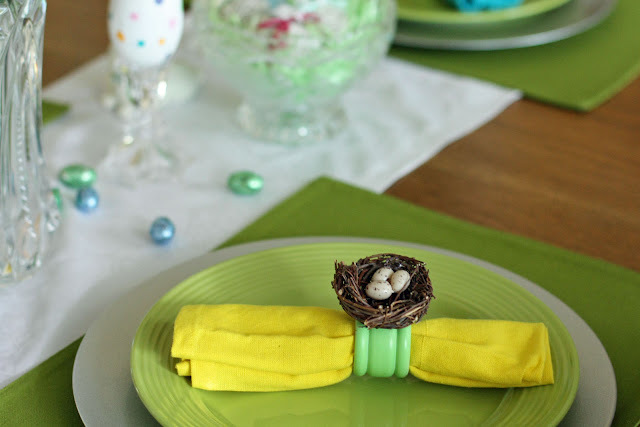 Great idea on the nest/egg napkin rings! Your table is amazing. I love the napkin rings. 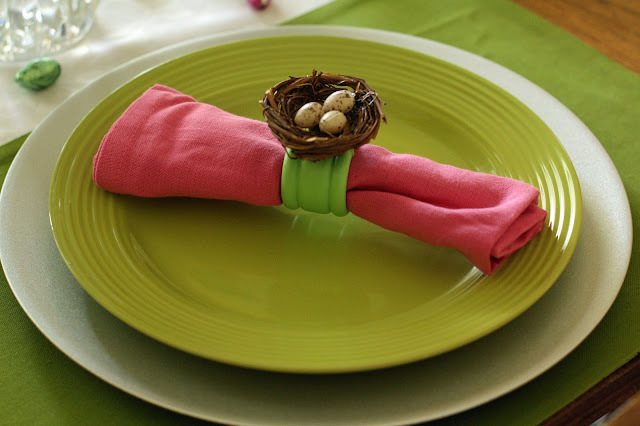 Your napkin rings are adorable! I will definitely be making some of those!!! Hi! Visiting from tt&j. Those napkin rings are the cutest thing EVER! I said 'awwww' all the way through this post because I love it all :) How festive! Im going to poke around your site a little bit. I would love for you to share this at my Friday link party! 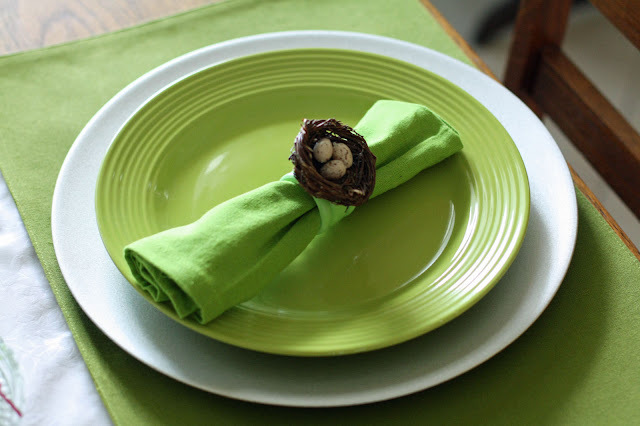 Your table looks great and I love these napkin rings! Have a wonderful Easter. Love the flowers! Perfect table that all who sit at will enjoy! Your table looks wonderful! I actually thought that the flowers were real lol!!! I am also going to try the napkinrings. 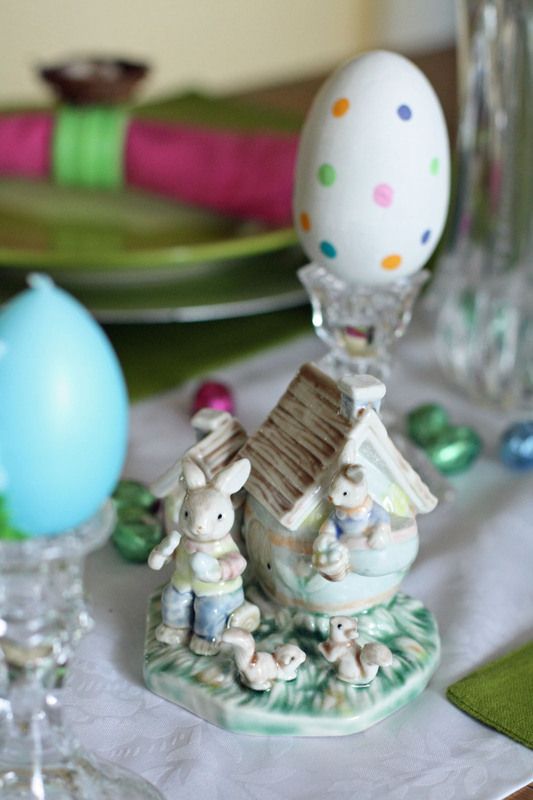 You did a great job on this, I think the green plates were a good choice and I absolutely love the painted eggs! My name is Sarah, I found you through Make the Scene Monday and am a new follower via GFC and Facebook. I am new to crafting, I haven't started on any projects. Right now I'm just looking for inspiration and ideas so I can decide where I want to start. I'm also always looking for creative people to feature on my blog. You can submit photos of any projects you are working on currently or a finished project and I am also looking for guest bloggers and as a guest blogger you can do posts related to your projects and your work. Skylar pretty much covers anything, so you can right about pretty much anything. So, if you are ever interested in an interview/spotlight, or would like to guest blog, let me know. Feel free to stop by and follow back. What a great table and napkin rings! 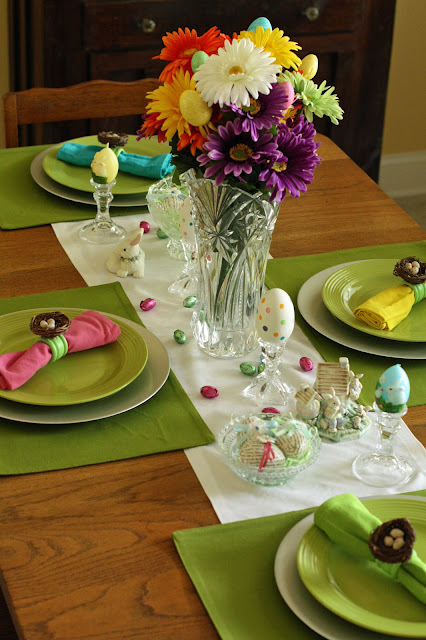 What a fresh and beautiful table scape, love it! I would love for you to share it at my new party which will be open this evening- "Pin It and Win It Wednesday" @ www.cheapcraftymama.com! Love this! Beautiful table! Thanks for the great ideas! Have you heard of Hellocotton?